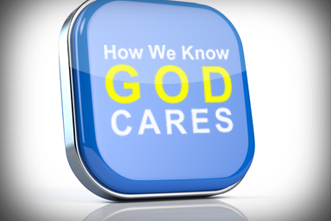 I must confess it has been very difficult for me to get my arms around the idea that God is involved in and cares about the details of my life. Two things cause the hang-up – capacity and interest. I know the Bible teaches that God has the capacity – that “even the very hairs on our head are all numbered” – I just don’t have a mental model for how this is possible. That is until I came upon an app that my daughter downloaded on her iPhone to track her jogs called Run Keeper. • the total distance we jogged. • our time per mile. • the total calories burned. • the total elevation climbed. • a Google map of the exact route we ran. • and congratulates you when you beat a previous time, which is logs. All for a buck 99! But it not only does it for my daughter, it can do it simultaneous for 10,000 people anywhere in the world. If humans can create a wireless contraption that signals a satellite in the sky to look down on us and provide this kind of detailed information all for a $1.99, it is not hard for me to imagine the limitless capacity of the God of the universe. But I have a second hang up – interest. Why? Why would God want to follow the intimate details of my mostly mundane life? Certainly, he has better and more important things to do. Previous articleSara Groves: "Eyes on the Prize"
Next articleCrisis Leadership: Are You Always Putting Out Fires? As the senior minister of Oak Hills Church in San Antonio, Texas, Randy Frazee has the privilege of teaching and leading in partnership with pastor and author, Max Lucado. Prior to coming to Oak Hills, He served as the teaching pastor at Willow Creek Community Church and spent 15 years as the senior pastor at Pantego Bible Church in Fort Worth Texas. He is also the author of several books, The Connecting Church, Making Room for Life, The Christian Life Profile Assessment, and Renovation of the Heart Student Edition, and his new book coming out in August of 2011, The Heart of the Story: God’s Masterful Design to Restore His People.